Less than a three-hour drive from Montreal and about a six-hour drive north of Boston, Quebec City is often said to be that most European of North America's cities. The French-speaking metropolis, which was founded in 1608 and has a population of about 516,000 sits on a high bluff on the St. Lawrence River, with a charming Old City enclosed entirely within an ancient fortification. Quebec is a wonderfully intimate city, highly walkable and oozing with history (many of the finest old buildings in the city are now hotels). Geographically, it is divided between two levels, Upper Town and Lower Town - the latter section lies low along the St. Lawrence River, and the former rises high above it, perched atop a magnificent ridge on the city’s eastern flanks. 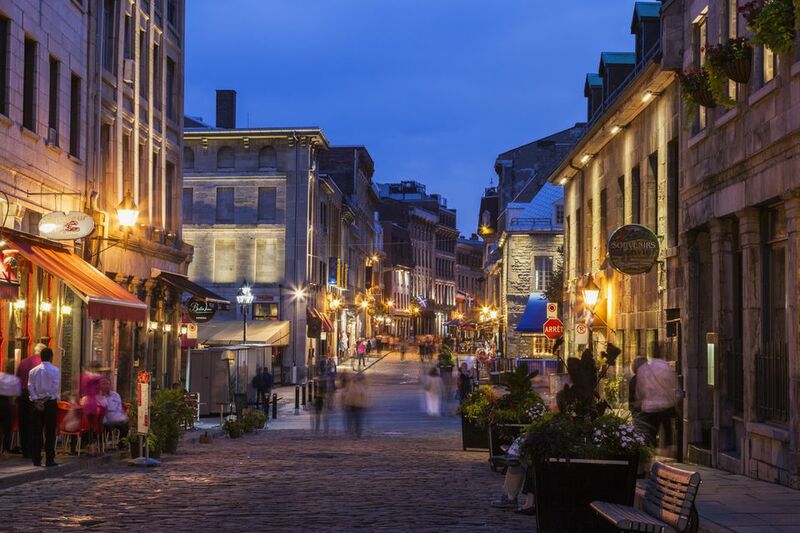 Quebec City is the sort of place you can enjoy simply by strolling about without a specific game plan, just soaking up the atmosphere and ducking inside inviting galleries and cafes. Or you can explore some of the most fascinating museums and historic sites in North America, all of them within walking distance of the city core. Here are five activities and experiences that you shouldn't miss during your visit to Quebec City. Although Quebec City has no specifically gay neighborhood, many of the city's most gay-frequented bars, restaurants, shops, and B&Bs are in the Saint-Jean District, a lively corridor along Rue Saint-Jean (and nearby streets) extending west from Old City past Place d'Youville (site of Quebec's Fete Arc-en-Ciel Gay Pride celebration early each September) for several blocks to Avenue de Salaberry. Inside the city wall, in Old Quebec, Rue Saint-Jean is a bit more touristy but also quite fun, and during busy times, this stretch is closed off to auto traffic and turned into a pedestrian zone. Noted restaurants along this section, many with sidewalk terraces, buzz late into the evening. Outside the wall, note the elegant Theatre Capitol complex across from Place d'Youville and home to a world-class theater and cabaret, gay-popular restaurants like Il Teatro and Chez L'Autre, and the snazzy 40-room boutique Hotel du Capitole. Heading west across the busy and broad Autoroute Dufferin-Montmorency (there are crosswalks, fortunately), you'll enter what's sometimes referred to as Quebec City's gay strip. This stretch of Rue Saint-Jean is home to gay-popular hangouts like Bistro L'Accent, Le Drague Club Cabaret, Tutto Gelato, Brulerie Saint-Jean coffeehouse, Snack Bar Saint-Jean (delicious poutine), Erico Choco-Musee (chocolaterie and museum), La Piazzetta, St. Matthew (bear-ish gay bar), Sauna Bloc 225 gay bathhouse, Chateau des Tourelles (an elegant gay-friendly B&B), and plenty more. Regardless of whether or not you have the chance to stay at this elegant, old-world hotel, do be sure to stop by and have a look around the iconic Chateau Frontenac, whose steep copper roofs define Old Quebec's skyline as much as any other building. The adjacent Dufferin Terrace is a lovely spot for a stroll - you can enjoy expansive views down over Lower Town (and even catch a funicular down to Lower Town, if you'd rather avoid having to ascend and descend several flights of stairs), or walk south to an elevated pathway that leads around and up to the Citadelle and eventually to the Plains of Abraham. Occupying an expansive, leafy promontory high on a bluff above the St. Lawrence Seaway and within a short walk of Old City and downtown Quebec attractions and hotels, the Plains of Abraham Battlefield Park and adjacent La Citadelle de Quebec museum offer much to see and do, both indoor and outside. Along the Plains of Abraham, there are trails for biking, in-line skating, and jogging, plus ballfields and wide lawns for lazing in the sun - keep your eye out for bronzing eye candy during the warmer months. In winter, these same trails and lawns are popular for cross-country skiing and snowshoeing. Beautifully landscaped Joan of Arc Garden blooms with colorful flowers in spring and summer, and plaques set around the park detail the pivotal battles that were fought here (​you can read a good overview here). And right in the heart of the park, you'll find the city's exceptional art museum, Musée National des Beaux-Arts du Québec, which contains some 25,000 works of art contained within a striking building that mixes old and new forms. At the east end of the park, you can walk to La Citadelle de Quebec, from which trails also lead down toward Le Chateau Frontenac hotel and the heart of Old Quebec. La Citadelle was built in the 1820s, and is the largest British fortification ever built in North America - today it contains an intriguing museum and can be explored on hour-long guided tours. In a huge, light, beautifully designed building in Lower Town, adjacent to Quebec City's Old Port district, the spectacular Les Musées de la civilisation de Québec is that one museum you should try to visit if you only have time for one. The surrounding neighborhood, with the stylish and trendy restaurants and boutique hotels of Old Port and the more quaintly traditional (if touristy) narrow cobblestone lanes, old-world bistro, and art galleries of Lower Town are also well-worth exploring. An area just down the hill from the aforementioned Saint-Jean District, the formerly drab and industrial Saint-Roch District has undergone a major revitalization in recent years and now abounds with hip boutiques, gay-friendly bars, lively cafes, and even a few inviting B&Bs. It's a five-minute drive to Saint-Roch from the city center, or from the gay-popular section of Rue Saint-Jean outside the city walls (see above), you can make a scenic walk down Rue Sainte Claire (turn right here, just before you reach the imposing church, Presbytere Saint-Jean Baptiste), taking the curving staircase at the end of the street down to Rue Couronne, where on your right you can make a quick detour amid the lovely flower beds of Jardin Saint-Roch. At the first major intersection, Boulevard Charest crosses Rue Couronne and has a number of shops and restaurants (as well as the GLBT-popular TRYP by Wyndham Quebec Hotel Pur), but more charming and with a better selection of hip hangouts and bars, turn in either direction onto the next street, Rue Saint-Joseph. A left turn leads to some cool gay-friendly hangouts, like Le Cercle, a restaurant, wine bar, and performance space; and La Korrigane, an inviting craft brewery, and restaurant.